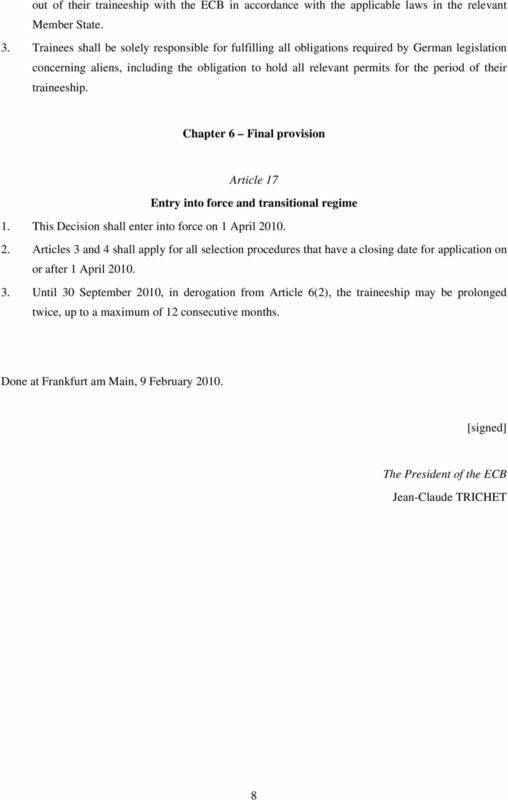 Download "DECISION OF THE EUROPEAN CENTRAL BANK of 9 February 2010 on the rules governing the traineeship programme of the European Central Bank (ECB/2010/NP4)"
1 DECISION OF THE EUROPEAN CENTRAL BANK of 9 February 2010 on the rules governing the traineeship programme of the European Central Bank (ECB/2010/NP4) THE EXECUTIVE BOARD OF THE EUROPEAN CENTRAL BANK, Having regard to the Statute of the European System of Central Banks and of the European Central Bank, and in particular Article 11.6 thereof, Whereas: (1) Traineeships at the European Central Bank (ECB) promote European integration and European citizenship by providing post-graduate students and job entrants with an opportunity to put into practice knowledge they acquired during their studies and by providing them with insight into the ECB s activities and operations. (2) By offering a traineeship programme, the ECB benefits from the current state of academic research and the enthusiasm and new ideas that trainees bring to the ECB. 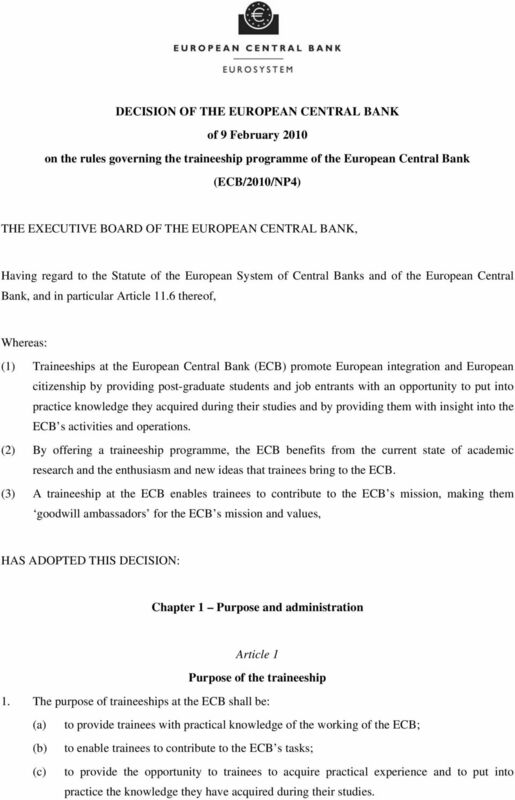 (3) A traineeship at the ECB enables trainees to contribute to the ECB s mission, making them goodwill ambassadors for the ECB s mission and values, HAS ADOPTED THIS DECISION: Chapter 1 Purpose and administration Article 1 Purpose of the traineeship 1. 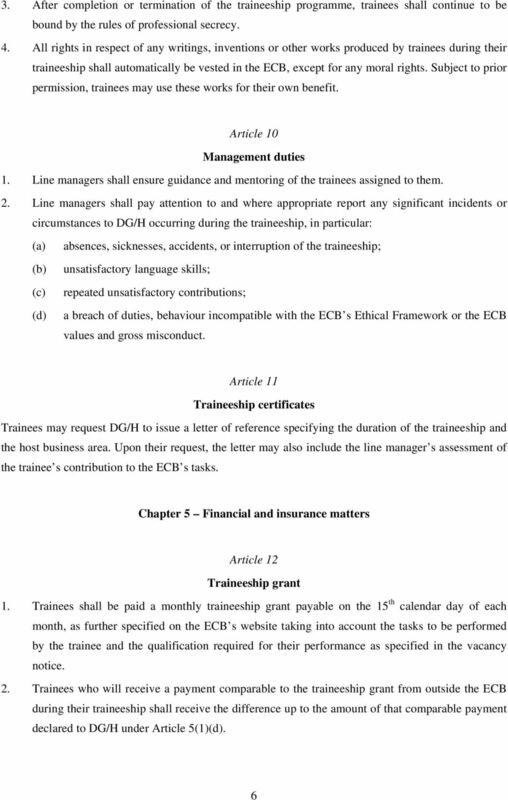 The purpose of traineeships at the ECB shall be: (a) (b) (c) to provide trainees with practical knowledge of the working of the ECB; to enable trainees to contribute to the ECB s tasks; to provide the opportunity to trainees to acquire practical experience and to put into practice the knowledge they have acquired during their studies. The Programme Schedule applies to the Bachelor of Nursing (BN) Level 7 (Credits 360). 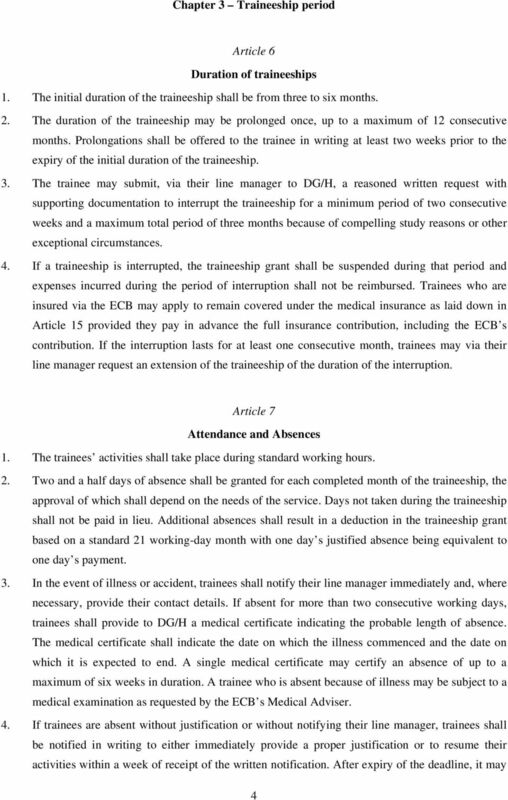 ELIGIBILITY AND REQUIREMENTS Q: Can I apply for a translation traineeship for university graduates? Q: Can I apply for a translation training placement? 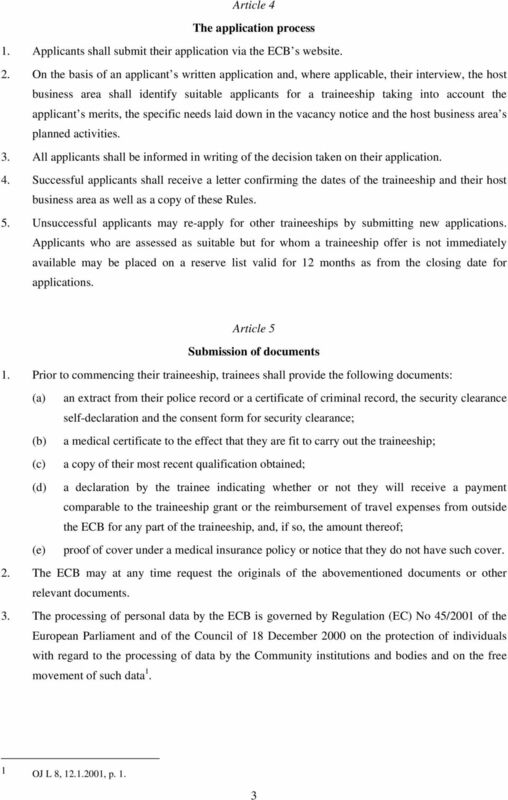 Q: Is there an upper age limit for traineeship applicants? 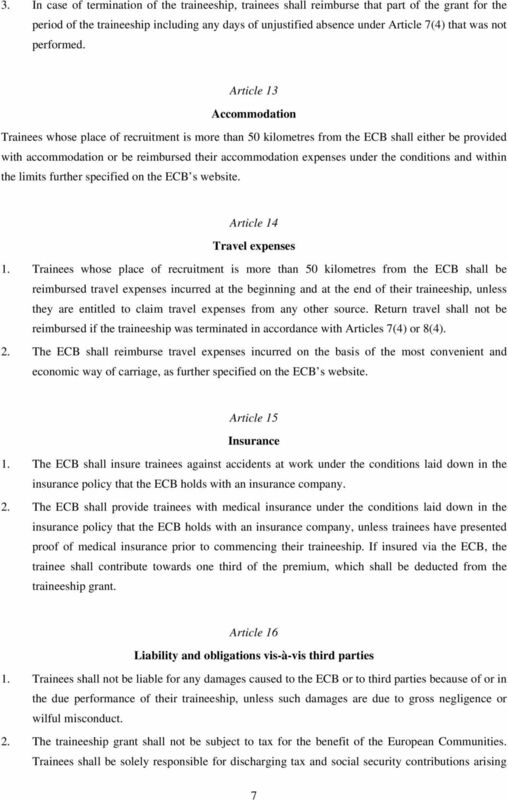 GCI (General Conditions of Insurance) Visana Ltd, sana24 Ltd, vivacare Ltd Valid from 2016 Health Insurance Managed Care (FLHI/KVG) Contents Page 3 4 5 6 6 7 7 8 8 1. General principles 2. Benefits 3. STATUTE OF THE COMMONWEALTH SECRETARIAT ARBITRAL TRIBUNAL Adopted by Commonwealth Governments on 1 July 1995 and amended by them on 24 June 1999, 18 February 2004, 14 May 2005, 16 May 2007 and 28 May 2015.